Kind of a stupid game, isn’t it? 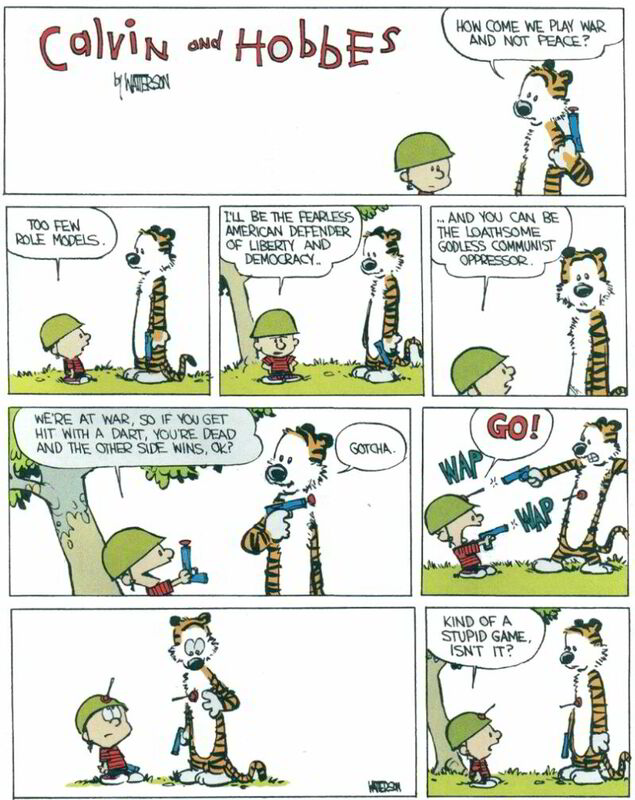 This has always been my favorite Calvin and Hobbes strip. It made sense back in 1989 and it makes sense 15 years later. It will probably always make sense. I’m not sure why I thought of it just now, but it comes up every once and a while in conversation, so I decided to post it. How do you think us Americans would you feel if all of a sudden we were the ones wrongly classified as the Loathsome Godless Communist Oppressor by some nation bigger than us? Perspective changes pretty quick, it’s too bad that we don’t. "“How Come We Play War and Not Peace?”" by Jeremy Felt, unless otherwise expressly stated, is licensed under a CC BY-SA 4.0 International License. Previously: Do I really need a title? You see the picture. Next: Whatever makes you happy, whatever you want.